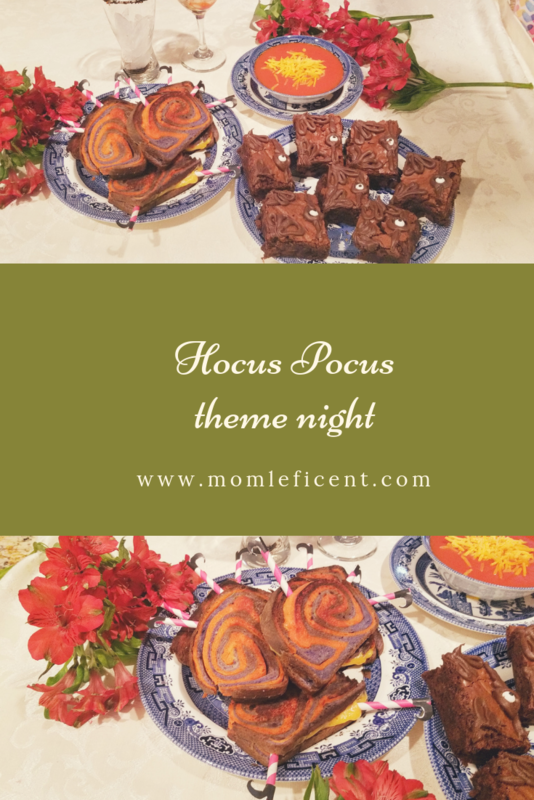 We have been having a lot of Fall fun in the Momleficent household over the past few weeks! I swear the creative juices have been brewing as the temperatures have fallen a bit and have started to feel a bit more fall like. This past weekend was no exception – fall festival season is in full swing in the North Georgia mountains and we are having a blast. This past weekend was weekend number 1 of the Ellijay Apple Festival, Mule Camp (that particular town started as a camp site between larger areas a long long time ago), Gold Rush and our school Fall Cultural Festival are next weekend, and they just keep going into November. How fun is that? After a hard day of festivaling and being over indulged by one of their Grands, the tinies decided it was time for a theme night. Well, how can you say no to that? I don’t know that I have the ability to say no to any theme for any reason. I love Hocus Pocus, and the kids think that the witches are the funniest things ever. 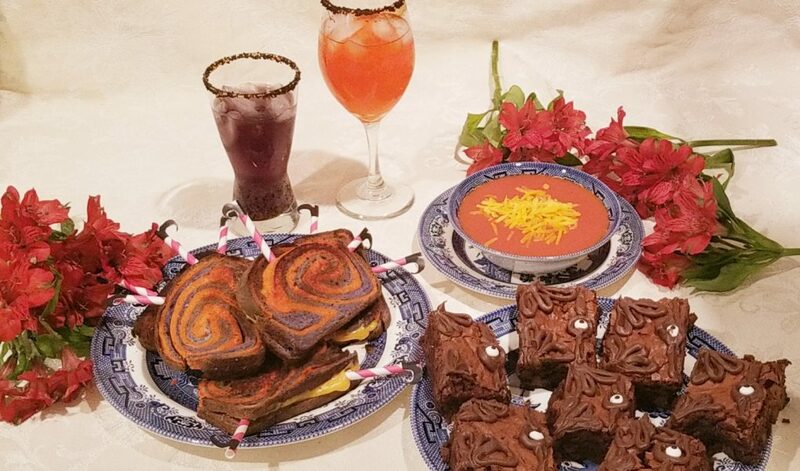 Well, what could I do but breathe deeply, sniff the air, and gasp “children!” We made grilled cheese “sand-witches” using the rest of the Halloween bread I made last weekend – so yummy! 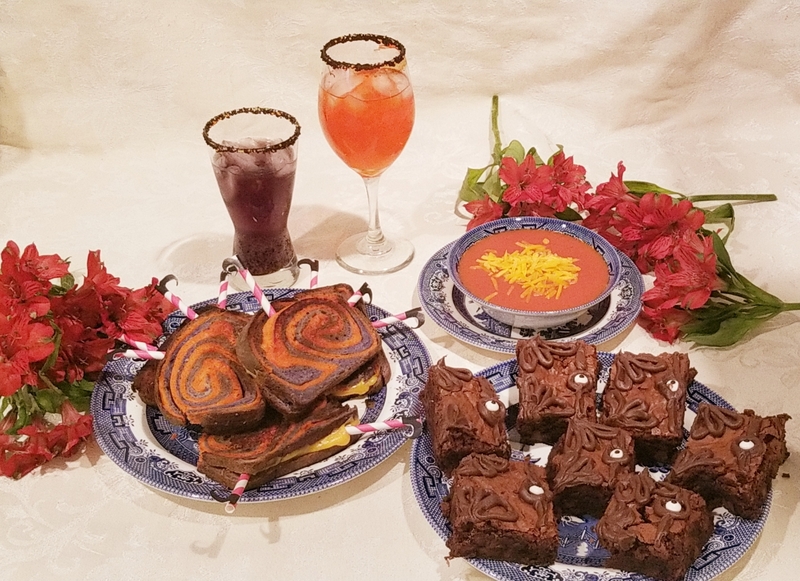 Add a witches’ cauldron (tomato soup), The Book brownies, and some witches’ brew (color changing drinks) to the mix and you have a super easy, really fun theme night that can be prepped ahead. As a matter of fact, I made the bread the weekend before and froze one loaf in anticipation of our “sand-witches” this weekend, the brownies were made the night before, just leaving the grilled cheese and tomato soup as a prep for the actual day of. So let’s get to it. First, check out this relatively easy bread recipe here, where I show you step by step how to achieve the beautiful, bright colors in our Halloween bread. I sliced the bread in thin (1/4 inch slices) and filled with American cheese slices. 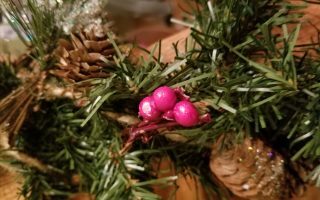 I like to use two – go big or go home, right? Then spread real butter on both sides and slide into a medium hot skillet to toast. 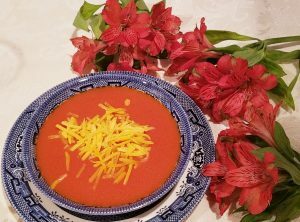 The soup was just Campbell’s (not a sponsored post!) that I heated on the stove, and the brownies were from a box. The witch part is so incredibly easy! I cut small witches shoes from regular paper – if you would like my template, be sure to subscribe to my newsletter. You will get the password to my free resource library which includes this template and a few more! I glued the tiny shoes onto striped paper straws so that it looks like they are stocking legs, then slid them between the layers of my sandwiches at skewed angles to make them look like little squished witch sandwiches. So cute with the Halloween bread! Now here’s the kicker. I am going to give you my secret to the fudgiest, most moist and delicious brownie you have ever had – of course it also has a gazillion calories, so this isn’t for diabetics, small children, or anyone who doesn’t have a stomach of iron. Seriously, small brownies guys. Make your brownie recipe as usual, replacing three tablespoons of the water with additional olive oil (use olive oil in entire recipe – no vegetable oil), then add eggs and mix well. Line your pan with foil – the whole pan – overlap layers if needed – then spray well. Right before you transfer the brownie batter to the pan, stir in ½ bag of semi sweet chocolate chips – yep, stir them right in. Bake for about 45 minutes (I make two batches and bake them in a 9X13 pan, and remove from the oven. They are going to still be a bit liquidy – this is the melted chocolate – completely normal. Let them cool to room temperature – no matter how much you want to dip into them, don’t! When they are completely cool, you can cut them into the appropriate sizes and decorate as you want. I just piped milk chocolate designs on the brownie squares to mimic the Celtic designs on the book corners, and of course, added a candy eye – outlined it in icing, and made a little line to the top and bottom from the center of the outline to give the impression of the lock plate. The mocktails I made the kids were super easy! These work best in clear glasses so that the kids can see the color change. We made purple and orange for this theme night. I like to rim the glasses in sanding sugar first, just for fun. We used black sanding sugar and a few black and orange nonpareils for fun. To rim, use two cereal bowls – one with plain water and one with sanding sugar and nonpareil mix. Dip the rim of the glass into the water, then immediately into the sugar and set aside to dry – all done!. When you are ready for your little boys and ghouls to giggle, (do this part out of their sight) drop food color (liquid) in desired combos (ex. two drops red and 1 blue for purple – 2 drops red and 1 yellow for orange) then carefully fill the glasses with ice. This hides the food color. Fill with Sprite (or seltzer water if they like that) and watch the clear liquid “magically” change into a colorful potion! They will love this and it will instantly make you the coolest mom of the pre school set in town. 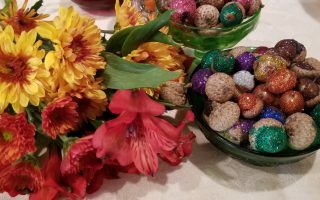 We had a blast with this theme night – not to mention the kids love to drink our of my stemware – I don’t know why, but they feel so grown up when they do! Do you have special treats or meals that you make for Halloween? 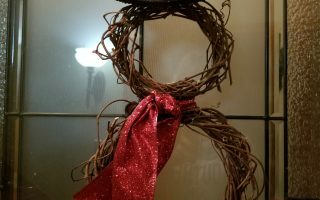 Next ArticleFreezer Cooking Round 2 – Are You Chicken? Love this, especially the sand-witches. I need to do this when we watch Hocus Pocus to really make it a fun experience. Any kid would get a kick out of squished witches. They turn out really cute with regular bread too. Love your ideas! You are so creative!! Thank you for sharing them!! Thank you do much. The kids have fun in the kitchen with me. I love to listen to them talk with each other while they decorate and cook. So creative! Looks like a fun theme night. I love these! The brownies were a hit with the little eyes! Bookmarking this, and pinned it to go back to this weekend! Absolutely love these! Thank you so much for the inspiration. That made my day! Thanks. We had so much fun with these. The shoe template is in my resource library if you want it. Enjoy! I love that it is so easy…that’s the way I roll! You and me both! I love theme nights, they are so much fun!